Showbiz Christchurch celebrates its 80th anniversary in 2018 with one of the most popular line-ups of major musical entertainment it has ever staged and the announcement of its first annual season sponsor. Christchurch law firm Saunders & Co are partnering with Showbiz Christchurch and have put their name to the 2018 season. Saunders and Co General Manager, John Bates says that it is Showbiz’s proven track record of delivering a consistent, innovative and high quality product, with widespread appeal that attracted the law firm to this partnership. “Showbiz Christchurch exemplifies what we value and strive for within our own organisation,” says Bates. The Saunders & Co 2018 season commences at the Isaac Theatre Royal with Wicked on 6 April, followed by Broadway Hitmen – a concert of Cole Porter and Andrew Lloyd Webber hits from 13-15 July, and is completed by Les Misérables opening on 14 September. 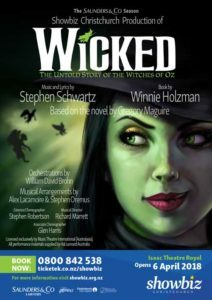 The Showbiz Christchurch season of Wicked is the New Zealand theatre company premiere of one of the most successful Broadway shows of all time. It tells the untold story of an unlikely but profound friendship between two girls who first meet as sorcery students at Shiz University: the blonde and very popular Glinda and a misunderstood green girl named Elphaba. The Showbiz production will be directed by New Zealand musical theatre heavyweights Stephen Robertson and Richard Marrett, and choreographed by Robertson and Glen Harris. 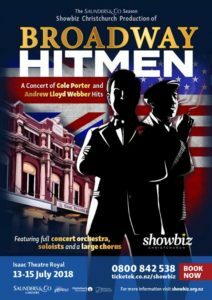 A full show orchestra, soloists and a large chorus will fill the Isaac Theatre Royal stage mid-year to present Broadway Hitmen, a concert of back-to-back hits from two of the biggest names in musical theatre, Cole Porter and Andrew Lloyd Webber. The concert will be under the baton of Ravil Atlas (Atlas Voices and TVNZ’s The Naked Choir) with stage direction by Nickie Wellbourn, who will step off-stage after her powerhouse performance as the rapping Sister Mary Lazarus in Sister Act. 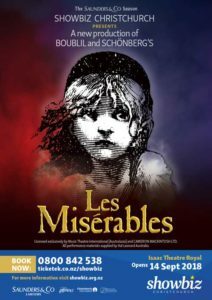 The season will be brought to an epic conclusion in September with Les Misérables, a grand and moving story about the survival of the human spirit which has won over 100 international awards and been seen by over 65 million people worldwide. This true modern classic is based on Victor Hugo’s novel and features one of the most memorable scores of all time, proving that great drama never gets old! * Discounts are preloaded into the online ticket price and apply to standard full price Premium and A Reserve seating when purchased as a single transaction prior to 31 January 2018. Discounts don’t apply to the $2.50 Isaac Theatre Royal Heritage Levy component or the Ticketek service fee components of the ticket price.